Postero-septal accessory pathways (AP) are a rare cause of intraventricular dyssynchrony and severe LV dysfunction in children. Beside the common treatment with radiofrequency ablation of septal substrates we present the case of a successful pharmacologic resynchronization in a 13/12 years old male toddler with Wolff-Parkinson-White syndrome (WPW) and severe LV dysfunction (left ventricular biplane EF of 31 %) due to intraventricular dyssynchrony with septal to posterior wall motion delay (SPWMD) of 350 ms. Interventricular mechanical delay (IVMD) was 65 ms. Using propafenone, pharmacologic cardiac resynchronization could be achieved. 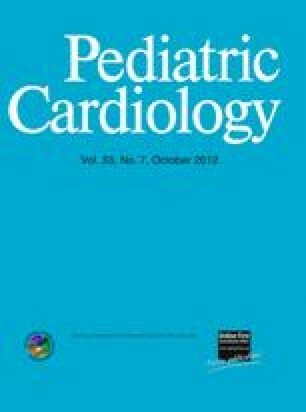 Pharmacologic resynchronization should be considered as safe and effective alternative to catheter ablation in very young children. The online version of this article (doi: 10.1007/s00246-012-0310-z) contains supplementary material, which is available to authorized users.